Started in 2004, Ghostbikes has quickly grown from its humble beginnings selling quad and pocket bikes to become one of the largest motorcycle and motocross outfits and accessories retailers in the UK. In this store, you can explore a wide range of motorcycle helmets, boots, gloves, clothing, parts & spares and accessories from top industry brands as well as their own brand products. The company employs a dedicated purchasing team, including national level bike riders who continually search for new products to fulfil the changing needs of motorcycle riders. Ghostbikes soon expanded its reach across Europe, currently serving the needs of motorbike riders in 25 European countries and plan to grow this number in upcoming days. Ghostbikes have earned a reputation for superior quality products at unbelievable prices and offering excellent customer service. If you are looking for the hottest offers from Ghostbikes, browse our motoring voucher codes on this page and grab yourself a bargain as soon as you can. The example deals below will show you how much you can save here. These promotional codes will unlock incredible savings on helmets, boots, gloves, clothing and accessories. For more variety in motocross clothing, you can also shop from ProBikeKit. New offers are regularly added to our website, so bookmark us today. Browse the bikers collection on the Ghostbikes website. Choose the products you wish to buy, and select the right size and colour before adding them to the basket. Under Order Options, click Add Discount Code to use your voucher. Apply the code and see the drop in price. 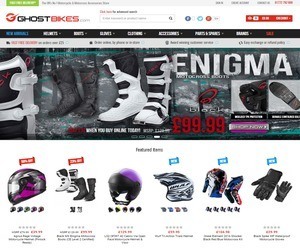 Ghostbikes is a complete motorcycle clothing and gear store that aims to provide high quality products at the lowest possible prices paired with unmatched customer support. Here, you can find a massive collection of motorcycle clothing, helmets, armour, gloves and accessories from well-known brands such as Spada, LS2, TCX, Shoei, to name a few. Above everything, Ghostbikes offer an amazing price match guarantee as well as special discounts of up to 70% off and free shipping.